We don’t often see a Leyland Comet with bus or coach body, as it was normally considered to be a lorry chassis, and we see even fewer in Municipal liveries, but Douglas Corporation’s fleet was renowned for being "different"! KMN 519 is an example of the CPO1 model, with Park Royal B30F body, and we see it in Bold Street, Fleetwood, on 18 July 1999. It is taking part in the Tram Sunday event. Just look at that enormous bonnet, the steering wheel and imagine the driving position in relation to it. To pull up behind a small car in heavy traffic must require some careful judgement! No problem at all, just stop where you can still see Tyres and Tarmac, shouldn’t be any closer anyway. The Douglas fleet always seemed to be immaculately maintained and turned out. It had several quirky features. In addition to these bonnetted Comets it had Guys similar in design to LT’s GS class which had huge destination boxes front and back for the very informative route blinds. There were also some ‘conventional’ saloons with the same arrangement. Some of the Regent V double deckers also had the large destination displays. Brings back happy memories of holidays spent on the island in the summers of 1967 and 1970. Another quirky feature in those days was the pubs being open all day! Interesting thought from Chris, and reply from John. I used to work with a fellow whose parking idea in the office car park was to apply the handbrake when he hit the wall. One of my neighbours uses the same method. He calls it ‘parking by braille’. . .
Actually, Chris, the driver’s view from the cab of the Comet was not as bad as the picture of the Douglas example suggests. That photo has been taken from a position quite low at the front, which exaggerates the bonnet height and length. 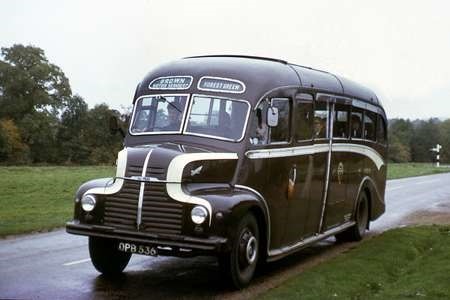 I frequently drove the former Brown Bus (A.T. Brady of Forest Green) Comet CPO1 on the Forest Green – Ewhurst – Wallis Wood – Horsham route on my weekend moonlighting job (excuse mixed metaphor) when the Brady business was taken over in 1971 by J.D. Wylde t/a North Downs Rural Transport. Initially, the Comet model was powered by the 75 bhp Leyland O300 5 litre diesel, though a petrol option was offered for export. The direct top five speed gearbox had sliding mesh engagement for first and second, and constant mesh for third and fourth. A Girling hydraulic braking system was fitted. In 1950 the engine became the 90 bhp O350 of 5.76 litres, and the model thus became known as the Comet 90. 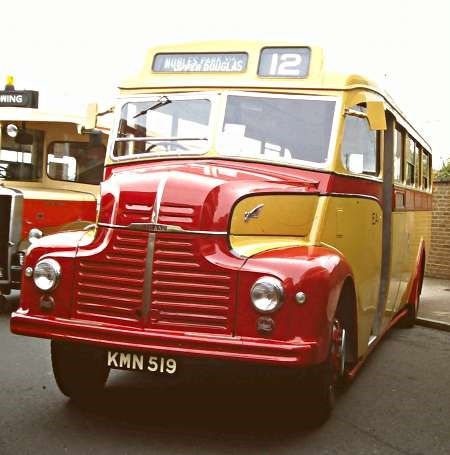 The bonnet structure was the product of Briggs Motor Bodies which also supplied the front end for the LT Guy GS bus, as well as Ford and Dodge goods models. When Ford took over Briggs in 1953, the supply to other manufacturers ceased. Here is a picture of OPB 536, a 1950 CPO1 machine with a Duple C32F body, taken at Forest Green. The Comet was a pleasant vehicle to drive, and the gearbox quite easy to use. Its only vice was the abysmally large turning circle that required precise placing of the machine on tight corners. I recall reading somewhere that OPB 536 was originally supplied with a petrol engine but was quickly converted to diesel, though this seems improbable to me. I understood that OPB 536 was subsequently bought by preservationists but I can find no recent references to it, so one must fear the worst. Actually, Roger, the view was taken at my normal viewing height of camera to eye – I’m 5ft 8in – and with my feet on the road. I suspect your view of OPB might have been taken from a grassy bank. Yes, the angle of view does affect the perception quite a lot! A nice shot of a very early AEC Regent III taken on the Isle of Man about 1964/5. The Northern Counties bodywork that Douglas Corporation seemed to favour is quite obvious by the front upper deck. 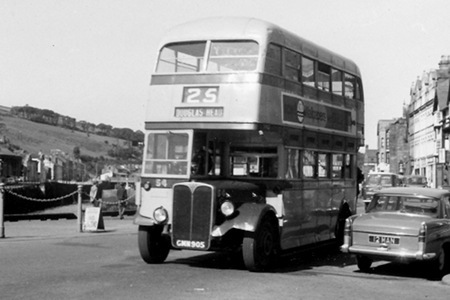 An interesting bit of information I came up with whilst researching Douglas Corporation was from Peter Goulds very informative website was that buses which operated within the borough boundary did not require road tax, if the route took it outside the boundary then it did. Needless to say they only had enough buses taxed to do the necessary routes and the letters ‘EA’ which stood for ‘Extended Area’ accompanied the fleet number. 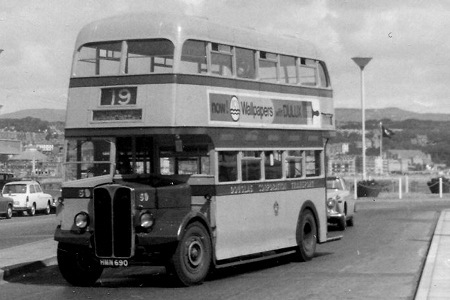 With a change of rules in 1964 no Douglas Corporation bus needed road tax to operate. Something I have noticed but has not been commented on or explained is that DCT 56-59 (HMN 687-690) delivered in 1947, 60-63 (JMN 724-727) delivered in 1948 and 64-65 (KMN 835-836) delivered in 1949 had consecutive chassis and body numbers and were virtually identical, whereas the rest of the 1949 delivery, 66-71 (KMN 837-842) had much higher batches of chassis and body numbers, and were significantly different in outward appearance (gasket glazed indicators) and internal layout (one fewer seat on lower deck to create more luggage space). Was a batch of 10 chassis sent to Northern Counties in 1947, and when were the later deliveries bodied? This is a RT type Regent as its chassis number was O961 186 a provincial Regent III would have a chassis number beginning O9612 000 the 2 stood for series 2. A good way to tell an RT from a Provincial Regent is a more or less flat bonnet top with ‘T’ handles on the bonnet side. The RT also had a more rounder shaped front mudguards that allowed you to see the spring hanger on the drivers side. Douglas Corporation only had two RT type Regents the other four that were delivered in 1947 were of the Provincial type. This bus was in service with Douglas Corporation for 24 years being withdrawn in 1971 not sure if it went for scrap or preservation being a bit of a rarity. Sadly, after being withdrawn ‘for use as a source of spares’, both 54 and 55 were sent to a local scrap deader and dismantled. The next batch, 56-59 was subsequently sent to the same scrapyard, but 56 and 58 were sold on for further use. 58 survives at the Jurby Transport Museum, but in an unrestored state. Apart from the preserved example at Whythall do any CAMELS survive? I know this is slightly off topic but does anyone know the following – the differences between Douglas Corporation bus routes 11, 12 and 16, 17, 18 and 19? I know 11 and 12 ran from the Bus Station to Nobles Park and the 18 to Willaston but via which roads? In 1962 (I think it was!) the 18 set out via Victoria Street, Prospect Hill, Bucks Road and Woodbourne Road. After that I have no idea as we alighted at Woodbourne Road/Derby Road. I believe this route was previously served mainly by the 10, which was destined "Upper Douglas via Bucks Road". Paul, I’ve listings of DCT routes for 1948, 1950, and 1957 – the only year in which 11/12/16/17/18/19 are all running is 1950 . . .
19: Lord St – North Quay – Peel Road – Pulrose . . . so this service was not related to the Bucks Road group.